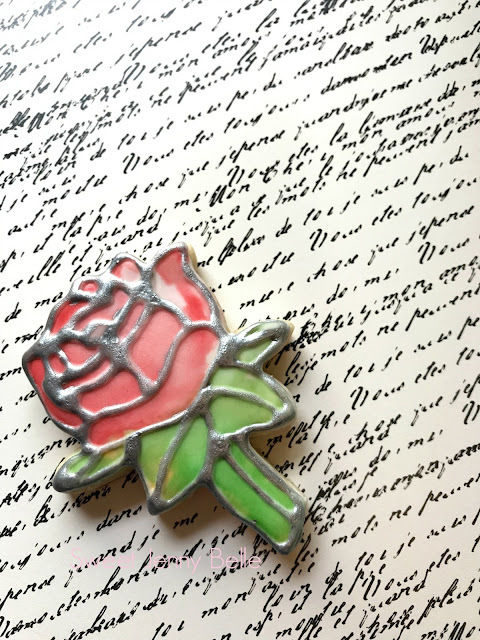 Mother's Day is just around the corner and I'm busy working on a few more gifts. My family is so lucky to be surrounded by such amazing women. My grandmother is alive and well - I feel so blessed that my children have been able to know their great grandmother. She has a gorgeous rose garden that she tends to with such care. I thought it would be wonderful to create some cookies for her. 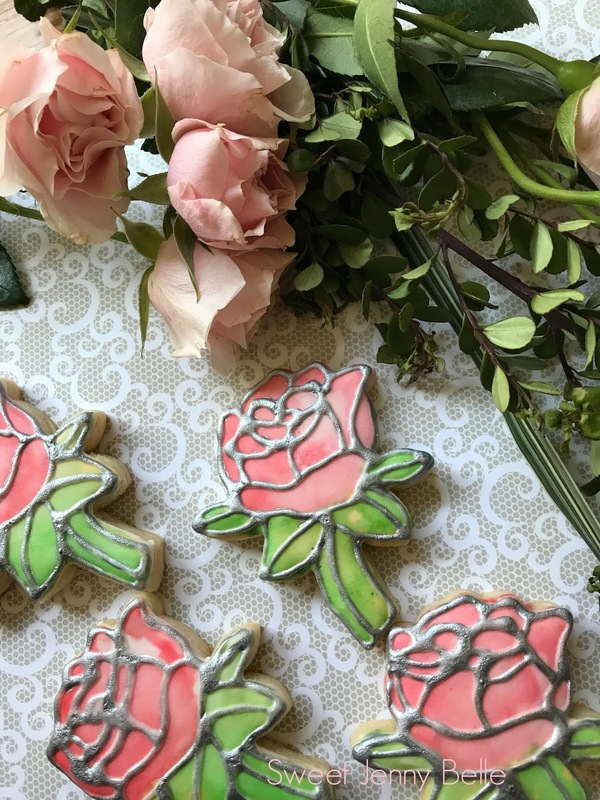 These stained glass rose cookies are easy and so beautiful! 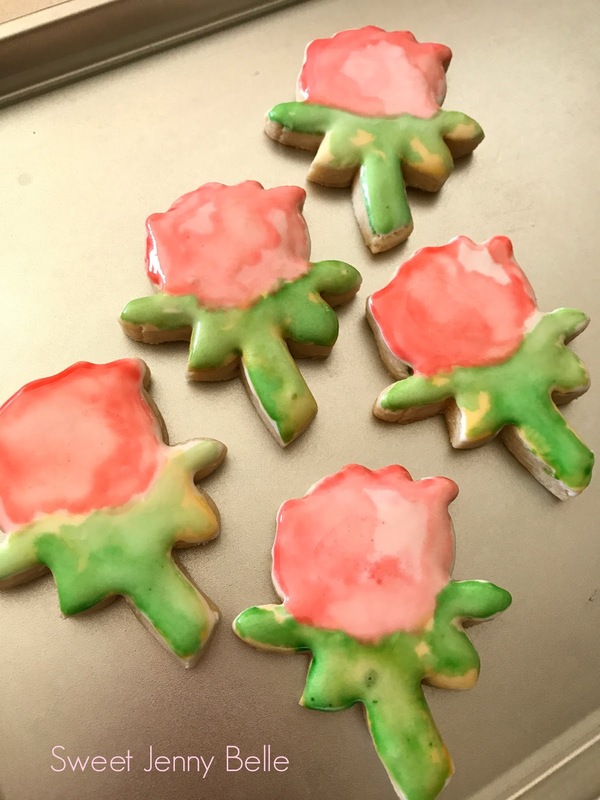 My rose cookie cutter is from the Cookie Cutter Kingdom - don't they have the cutest cutters? I love them! First flood all the cookies in a 15 sec white royal icing. Allow to dry for 2 hours or pop into a dehydrator for 15 minutes at 90 F.
For these cookies I used food gel watercolors. My friend has an amazing tutorial on how to create these over at The Painted Box. 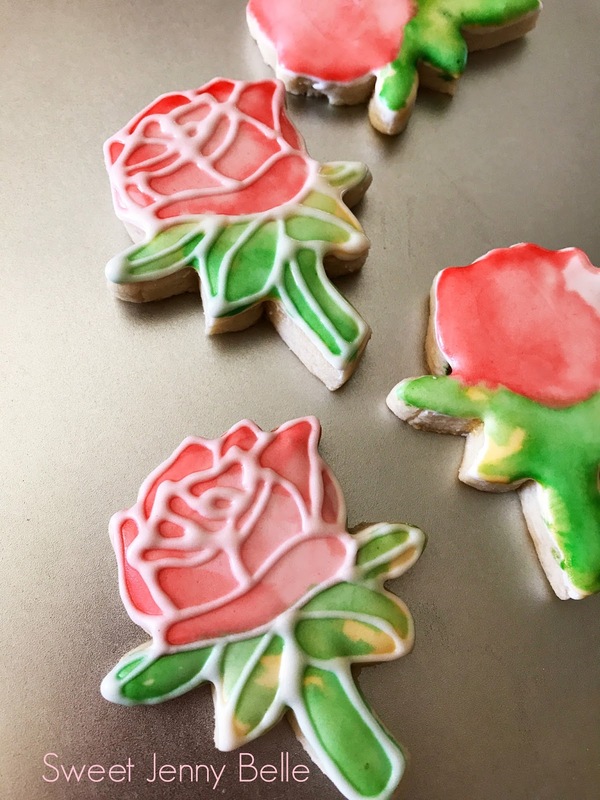 These are so fun - you will want to paint all the cookies! After you paint the cookies, allow them to dry for a bit. Next outline the shape and details of the rose with the same white icing. Now this is a lot looser than I would normally use for detail piping, however you are trying to mimic lead soldering. Soldered stained glass joints are a bit more thick and thin with spots of pooling. Those thick and imperfect lines are what you are looking for and will be more realistic. Once again, allow the cookie to dry for a few hours or pop into the dehydrator at 90F for 10 minutes. Now very carefully, paint the raised lines with an edible silver food paint. You can find a similar one to what I've used on Amazon over here. The "lead" painting will take some time. If you are running behind schedule, you could use a grey or black piping instead of the painted white icing to give the effect as well. These will be a cookie your friends and family won't soon forget. They are pretty easy, but they are unique and are sure to delight! Do you want to see how I made them? Click the video box above to see my fast paced cookie decorating movie. Don't they just shimmer? I also considered using a pearl sheen on them to have it glisten and sparkle even more. Maybe next time! 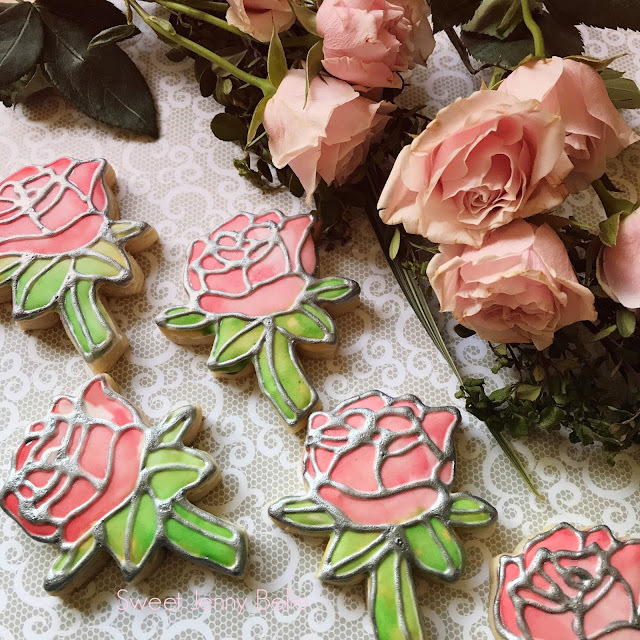 Don't forget to Pin this fun tutorial - it would be perfect for Beauty and the Beast parties, wedding showers and more! Are you looking for my royal icing recipe? Click over there to read all the details. Here's to all the women in our lives that love us, inspire us and pave the road for us.